You want to learn the secret for creating irresistible food images! I HEAR YOU! 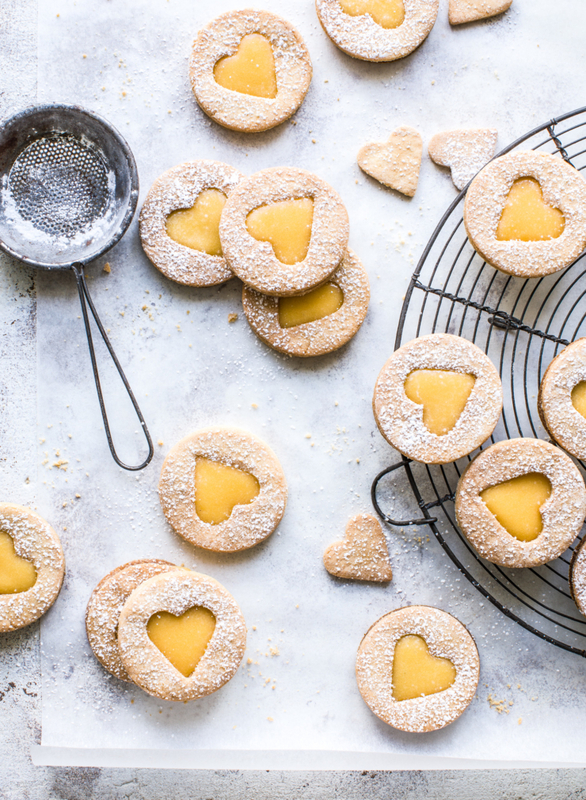 When I popped the question ‘what do you find the most challenging in food photography?’ on instagram – most of you wrote that food styling is causing you all the trouble! So, today, I want to take you behind the scenes with a little styling video that I recorded together with lovely Kat from Kat’s Films. BECAUSE WHO DOESN’T LIKE A SNEAK PEAK INTO WHAT HAPPENS ON THE OTHER SIDE OF THE CAMERA? And there is a lot happening! When is comes to creating jaw-droppingly gorgeous images , FOOD STYLING is CRUCIAL MY FRIENDS!!!! It’s an art of making food look attractive in front of the camera! It’s what makes people drool when they look at your food image. But it’s not only making food look pretty. It’s all about visualizing the taste, waking up all the senses, taste buds including! Your task is to ignite your viewers imagination! When you walk into the bakery, all of your senses are bombarded at once, am I right? Your eyes can see all the colours, textures and shapes of baked goods, you can smell freshly baked bread, hear the crust crunch and feel the texture of it while you hold a sandwich in your hand. Not too mention you can actually taste it! FOOD PHOTOGRAPHY should create the same experience – the hard part is, you have to do it all through your viewer’s eyes. So,let’s talk about the food styling details that create the sense of vitality, energy and visual excitement, shall we? The truth is, food styling takes a lot of thought, time and EFFORT! When I say effort I mean – taking the time to plan how you are going to approach the dish preparation and putting it all together. It also means, going extra mile to source the best ‘photo-worthy’ ingredients. And taking time to prepare the dish. I promise it’s all worth it though and as a result you’ll have an image you are super proud of! You can also see how much work went into this galette from the video, every element of the process was carefully thought of, while having a final dish in mind. From getting the juiciest fruit available, to slicing it carefully so that the fruit looks proportional when put together, and ensuring that the pastry has a beautiful round shape. It took a long lime before it was ready to photograph. Getting the freshest ingredients possible is of course nonnegotiable – but I am sure you already know that. It happened on several occasions that together with a client we swapped the ingredients in the dish for something else (also delicious!) rather than use not such a good-looking produce that was available! We just knew it wouldn’t look attractive in the image and it that case the photograph wouldn’t encourage anyone to cook the dish. When I say fresh I also mean, your job is to keep food ‘alive’ when photographing it. There is always a lot happening on set, so make sure that you always look back at the food to check if it still looks tiptoe, before capturing your final shot. Ensure that nothing looks dry and unappetizing – brushing water or oil on your ingredients can really work magic here! Spray some lemon juice on apples, bananas or avocados -this will prevent them from browning and give you extra time when photographing. Compose the photograph with empty plates and dishes or ‘dummies’ when photographing food that won’t last long on set,so that when it arrives you can capture it while it’s still fresh! Garnish just before capturing the final shot. If you decorate your dish (with herbs for example) too early, they might look flat before you take that last shot. Keep checking on your garnish, and replace it the fresh one if needed. Looking at our galette here as an example I composed the photograph exactly how I wanted it to look before adding an ice cream. If I didn’t do that I was risking the ice cream melting completely, before I composed the shot I was proud off. 03. THE BIGGEST STRENGTH OF THE DISH? What is that one thing that make your dish so extraordinary? Is it the colour, the shape, or maybe the layers? Focus your styling on that special something. When I was photographing this galette, I though it’s biggest strength was the juicy fruit filling. It’s such a summery dish and I wanted to make sure it bursts with freshness and flavour. I could predict however that the fruit will start to dry in the oven and also when cooling down, so I reserved some fresh fruit juice that was leftover after coating the fruit with sugar and I poured it over the top just before taking the final shots 🙂 This little trick brought my dish back to life. The best food developers and food stylists know how to pair different colours of food while making sure the flavours work together to make your taste buds satisfied. Your job is not only make the food taste delicious but also ensuring it looks INCREDIBLE at the same time. Does your dish need a little helping hand with some extra colour or is it vibrant enough already?Remember we eat with our eyes first! Get friendly with colour wheel to learn how to pair colours effectively for eye-pleasing images. If we look closer at the galette from our video, you can see that the galette itself follows analogous colours: yellow flesh of the peach, orange looking pastry, and red strawberries. Additionally it was paired with a complimentary colour background – blue – to really make it pop! 05. STYLE IT FOR THE ANGLE! Always style it for the angle you are shooting to show off different components! Some dishes might work great from several angles but you need to trust your visual instincts here! Some dishes, sadly, won’t.When I was styling the dish for the cover I was telling you about – the magazine asked me to do two different angles of the same dish so I had to style the dish twice – one for overhead and a different one for 3/4 angle. This galette, although super simple, it has a lot of depth! All thanks to layering different elements on the top of one another in our final dish! If you don’t want your dish to look flat, think about how you can incorporate different layers for that 3D effect. 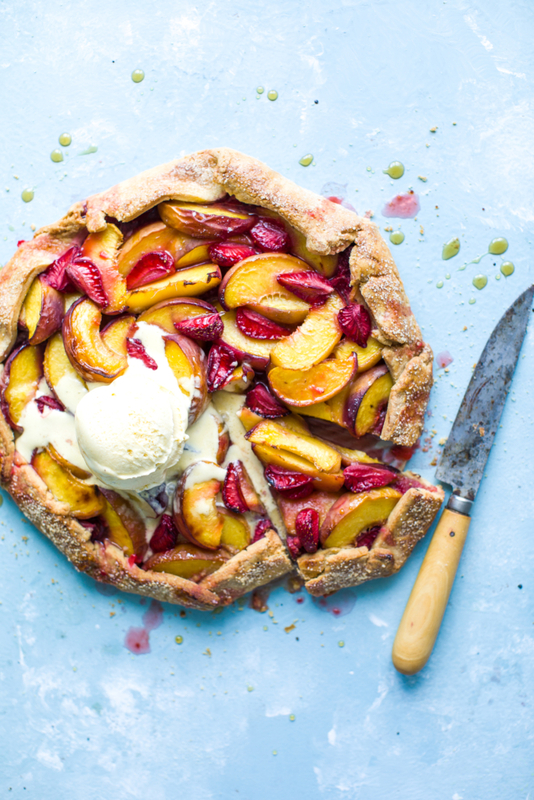 Let’s have a closer look – we have a layer of pastry, a layer of coarse sugar on the top of the pastry can be counted as an additional layer too, then there are few layers of sliced peaches , a layer of strawberries and a melting ice cream scoop. The secret is to make sure the layers are very subtle and cohesive. They should blend in and be so natural for the eye that your viewer won’t even think of them as layers. They should feel like they belong.This makes the image feel easy on the eye, not staged or forced. Always try to mix different shapes and textures for extra interest! Always think: ‘How can I make the dish look better?’ Everything can be done better! 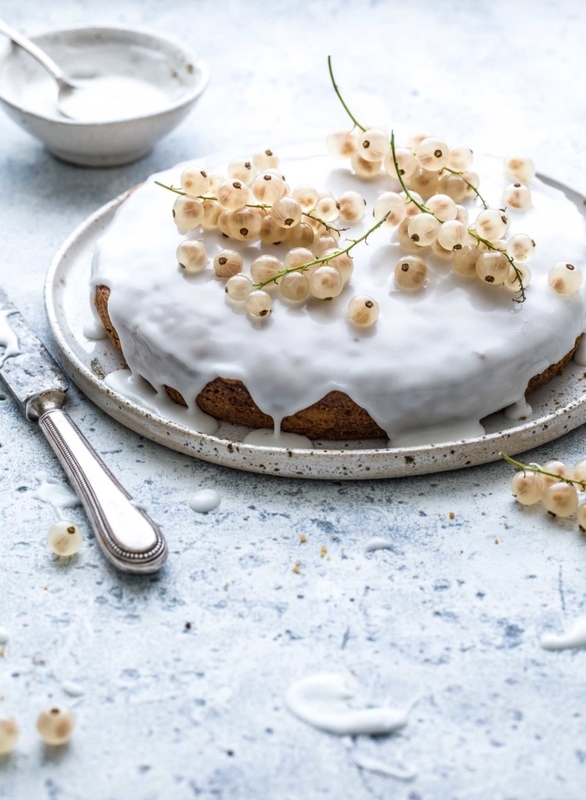 Is it a layer of icing sugar your cake is missing? Maybe a scoop of ice cream will add something more interesting? Or sprinkling coarse sugar on the pastry for extra texture? Sometime, adding maple syrup can bring your dish to life! And when it comes to savoury, something as simple as freshly ground salt and pepper can make the dish complete. My favourite way to evoke emotions is adding an illusion of movement to a still life image. It shows your viewer that the scene is happening right now, it creates an image that is much more inviting and makes your viewer feel a part of the it. It’s all about the small details that keep everything real. On the left you can see what the galette looked like when it came out the oven. Trust me here, it looked IRRESISTIBLE when I placed it on a kitchen counter!!! Camera however sees things differently than our eyes. Here is a proof – the photograph looks boring, there is no life in it, it gives you a feeling that there is something missing. On the right, you can see the same galette but there is so much movement happening, thanks to the styling! The slice has been cut out, there are juices spilled around, along with some crumbs. And the melting ice cream makes the styling look complete. Don’t be afraid to cut out a slice out of the cake, or maybe even two. Dig in fork into a piece of the cake. Spill juices. Scatter crumbs – this always wakes up imagination! Food photography is all about TAKING CONTROL. 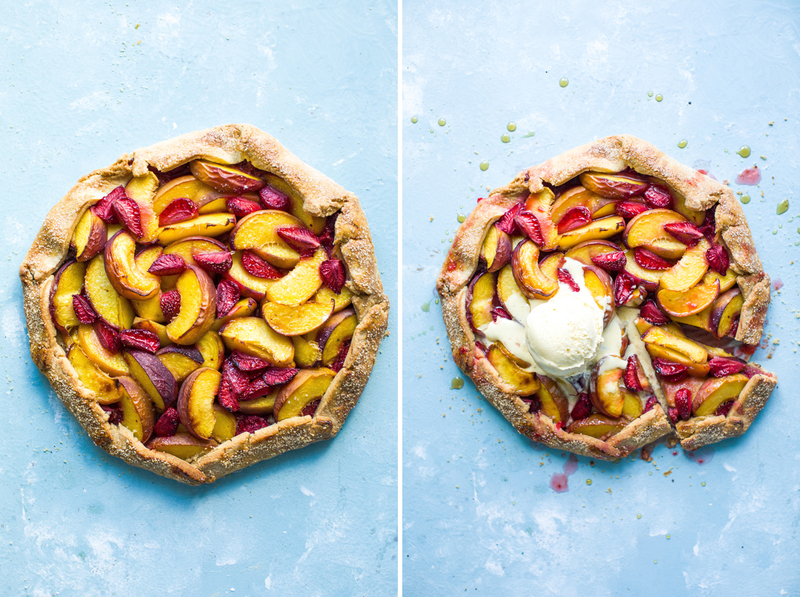 In this galette image, I really wanted to make sure the ice-cream is melted in a beautiful way, creating a lot of movement, but not overpowering the dish. 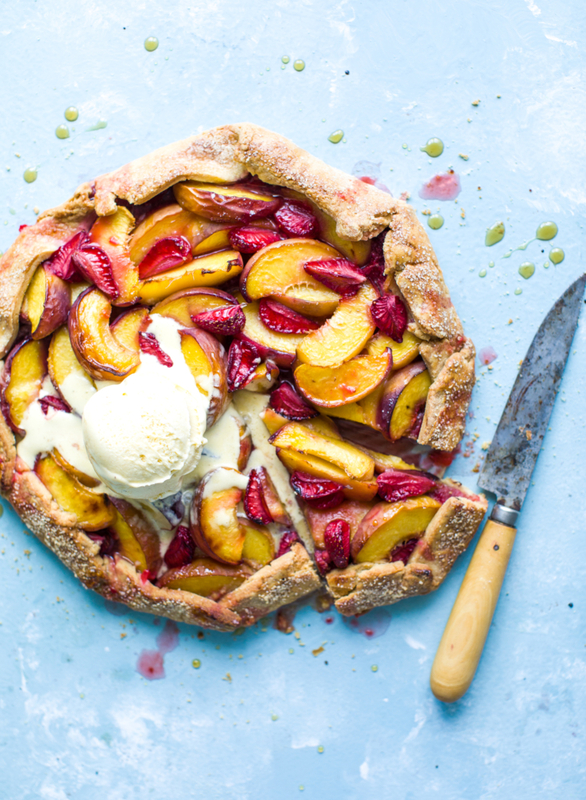 What I did then, I melted couple of tablespoons of ice cream in a pot over a very low heat, I then placed an ice scoop on the galette and poured melted ice cream with a spoon exactly how I wanted the melt to look – I took control. I’ll give you another great example! When I shot an image for crumble packaging sometime ago, my client really wanted the image to show a thick layer of fruit (of course they could not be overcooked). When we tried to do the crumble the traditional way, the fruit lost its shape, if we took it out of the oven earlier to make sure the fruit keeps it shape – the crumble was too pale. In the end, I cooked it all separately – fruit in the pot on the cooker, so that it looked cooked but it held the shape, and crumble in the oven until it was crispy and golden. Then I put it all together for a perfect picture. Like I said it’s all about taking control 🙂 And sometimes this will mean thinking outside the box. And just last little thought friends! Try to keep styling as natural as possible otherwise your dish will look forced. Imperfections are perfect. Embrace them! Is there any dish you find challenging to style? Let me know in the comments below!!! My blog, Bea’s cookbook, is a finalist in Saveur Blog Award in BEST PHOTOGRAPHY CATEGORY (I am mind blowned!). IT WOULD MEAN THE WORLD IF YOU COULD SEND YOUR VOTE MY WAY. VOTING takes second – all you have to do is follow this LINK, scroll down to find my blog in best photography category and leave your vote. When you do pouring shot where exactly you focus and what shutter speed do you use..
Really helpful info, Bea. Thank you! Lots of really helpful pointers there. My question is how would you approach styling a dish like a curry? I cook a lot of Indian food and it’s always in shades of brown, orange or yellow. I try to add some color & freshness with garnishes, but am curious to see how you would approach to style a drab dish that may not have the same visual appeal as a fruity pie? Thanks for sharing this Bea! You are such an inspiration 🙂 I am interested to hear more about styling curries and stews 🙂 I find it quite challenging to make it look good on the photo 🙂 any tip is welcome 🙂 btw, just voted! Wish you luck!!! Hey Zora! Curries are always tricky – I hear you! I am thinking about doing a curry mini styling tutorial on instagram – would you be interested? So inspiring! Thank you for this wonderful post. Thank you so much ANITA!!! !I am so excited you enjoyed it! Sending lots of love! My biggest challenge in food styling is the placement of the main dish or the hero element. What are the most basic or go to styles I can follow as a beginner? Hey Sasha!!! I am so happy you enjoyed it! If you are just starting out, I’d say you can never go wrong with following the rule of thirds (are you familiar with how photograph with a rule of thirds?) or keeping it central – which I often do. I would also say – exercise your eye by reading images that really inspire you. Does that help? Just shot a peach skillet cake yesterday and how I wish I had read this articles before attempting it. I was waiting for ice cream to melt to get all those syrupy details but then the top of the ice cream lost all the ridges and details. I wished I had thought about pouring some already melted ice cream and drizzling of maple syrup around. But now I am wiser thanks to you. Thanks for writing these article Bea. Really helpful and inspiring. Hey Suchita! Photography is always a learning lesson – no matter where we are on our journey. I learn something new every day! And that’s the beautiful part! Happy you found it helpful – I was so excited to share this tip as I knew it would make photographer’s life so much easier 🙂 Thank you for constantly supporting me! It means the world! All very helpful tips, especially the melted ice cream in the spoon! In my experience however when shooting for many companies and corporations there are compliance rules you have to adhere to. You can’t add something that’s not in the published recipe and you can’t change how the finished dish looks if it that’s not how it will look if it were to be cooked at home. These are extremely helpful tips though if you have total free reign over the dish. Hey Harshita!!! How exciting that you have recently started a blog! I am so excited that you learn a lot from my blog post! I love sharing! I photograph with natural light only so sadly I don’t have any tips on artificial lighting. Do you know THE BITE SHOT? Joanie has a you tube channel and I am more than sure you’ll find some artificial lighting tips on there! Thank you for all this info! So helpful! Is it important to have a background? If I haven’t enough light in my flat, what can I do? Aaaaaa!!!! So happy!!!! Thank you for a beautiful comment! Yes for the photography background – it can really make or break your image! Have you seen my background tutorial? It’s super easy to make and photographs BEAUTIFULLY! I would love to see what your light is like to give you the best answer! However for me shooting on a tripod with a lower shutter speed always allows me to capture beautifully lit images in low light situations. Does that help? Thank you so much for this awesome blog article and the little video, they are both very helpful ☺️ I have difficulties shooting meat, especially steaks, chicken wings or other pieces of meat that can‘t be cut into nice pieces. Do you have any tips on this topic? Ou Bea! firs I already put my vote of today, and second… this is so great, always after studying your posts (because I study them not read them) I feel I have a lot of work to do haha! So much valuable information and so many interesting things, logical thigs, creative things, to interiorize and to put into practice, so much beautiful work to do!! I read all of this post, including all comments and all of your answers, because you know, I’ve notice in this type of posts, there is almost as much great information in post itself as there is in the comments, with all those great questions. Thanks so much for sharing, for making everything so beautiful for us to learn, for inspiring us, and for your kindness. Have a great week dear Bea!! And here we go for that award!! Please remind us every day for voting, cause with all the things in my head sometimes I forget! Hi Sara! AAAAAA! You always put such a huge smile on my face! Makes me so happy that you learn a lot from these posts and from the comments – I love that you pay attention to all these things – as I agree with you – there is so much valuable information in these questions and answers 🙂 Thank you for stopping by! It’s always so lovely to see you on the blog! Sending lots of love your way! Ps. Thank you for voting! Fantastic tips Bea! Thanks a ton. I am still at the beginning stages of my photographic journey (skill building stage via personal projects) and so i haven’t shot a lot of food types, but I always struggle with styling salads. It just can’t get them to look natural and as tasty as they really are. I love eating and shooting salads but how can I style a beautiful salad where all the layers show up without too much of forced cuts and such? Would be soooooo great to get some tips on this. Looove your work! I am soooooooo happy you mentioned salads, Jayashree!!! Salads has always been my nightmare, because there is so many elements to style as well as it just doesn’t last long. I will be putting a tricky food styling guide and I will for sure mention my favourite tips for salad. But I don’t want to leave you without anything! When I photograph salad, I always compose my picture with empty dishes first, to get an idea where I place my plate. Salads are all about layering! Make sure you have all your ingredients separately, and put them together in a dish you will be photographing them, a layer after layer. Keep is ‘loose’ – that will make it look more natural. Misting it with some water will make it look fresh too – and it’s a trick I use all the time when shooting salads 🙂 Hope this helps for now! Big hugs lovely lady! I need an “Edit” button Bea, seriously. Bea, your work is amazing! I have one question for the article – could it possible for us to see the final image straight out of camera before processing? Thank you! Hey Kasia! You inspired me to do an editing post with before and after! Would you be interested in that? Thanks for the excellent tutorial, I really appreciate the time and effort put into this! Like some commenters above, I also struggle the most with styling liquid dishes – soups, curries, and stews. These are often brown, and the ingredients sink to the bottom, so it’s a real struggle to showcase them. Any tips you could share would be much appreciated. Thanks again for this awesome article! Hi Alex! Right!!! I’ll brainstorm and put together a tricky food styling guide as I feel there is a lot of information to be mentioned about this type of food. Thank you for bringing this up! Hey Bea!!! I always find cookies to be tough to style! Other than payed out in a line or stacked! Hey lovely lady! I think your cookies always look fab. But I think I know what you mean – composition wise they can be limiting! Let me have a look at your pictures and see if I can help!